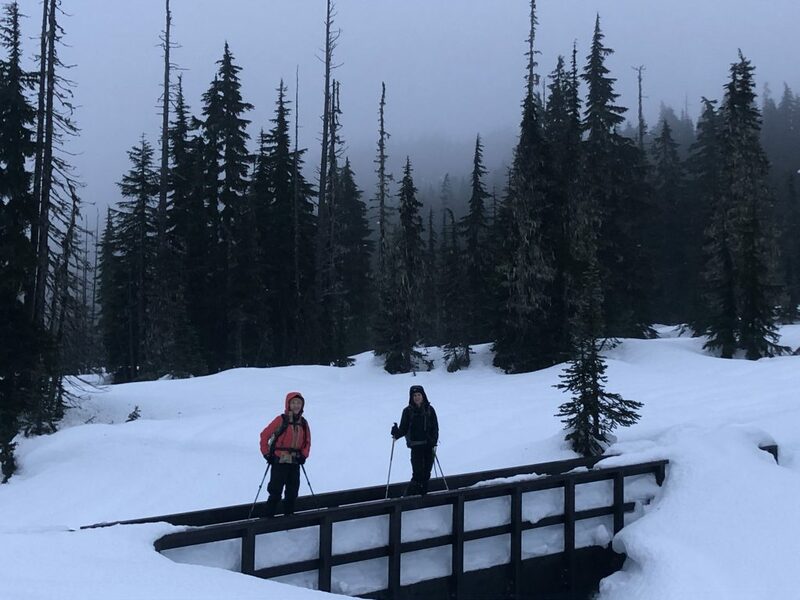 We started our ascent to Battleship Lake, crossing a stream over a make shift snow bridge. It had narrowed, due to the warming of the snow, however we could see it still held what appeared to be significant depth. Cindy crossed first and it seemed just as we were joking about the treacherous cross, the ledge fell away under her feet and we almost lost Cindy to a hole and the creek far below. She heroically grabbed the remaining shelf and lifted herself up; Seonok saving her water bottle from a rolling drop down into the creek. The rest of us hopped over the snow ledge and commented how likely that will be gone very soon. We proceeded on our final stretch of trail, crossed another groomed track and started to break trail. 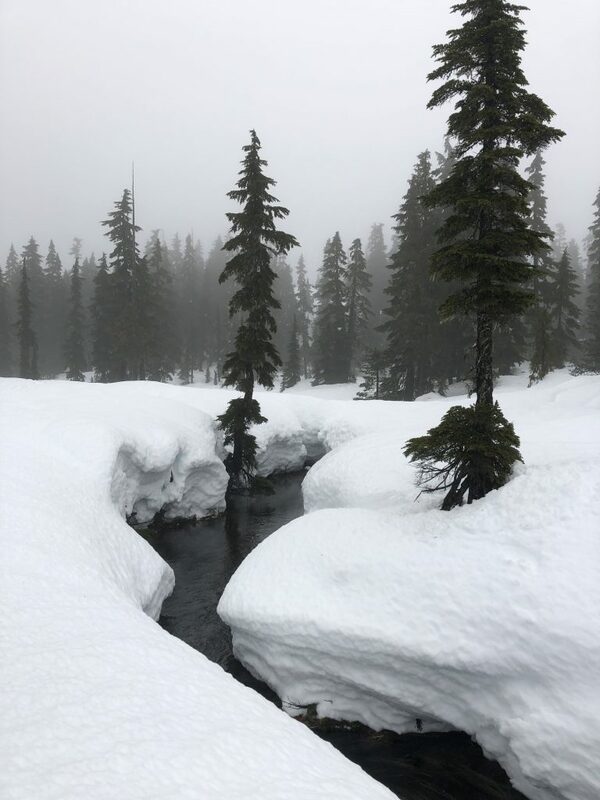 For a small part of our hike along Battleship Lake, we had remnants of one snowshoer’s trail that helped somewhat, however, these quickly ended and we were on our own making new tracks once again. Beginning sections of the lake appeared soft and watery; we choose to follow along the side given the recent warm weather pattern. We reached the end of Battleship and started our incline up towards the base of Elma. We sought out steps under the trees where the snow had hardened, making some of the steps easier, however that was quickly followed by deep sinking steps, most times past the knees. 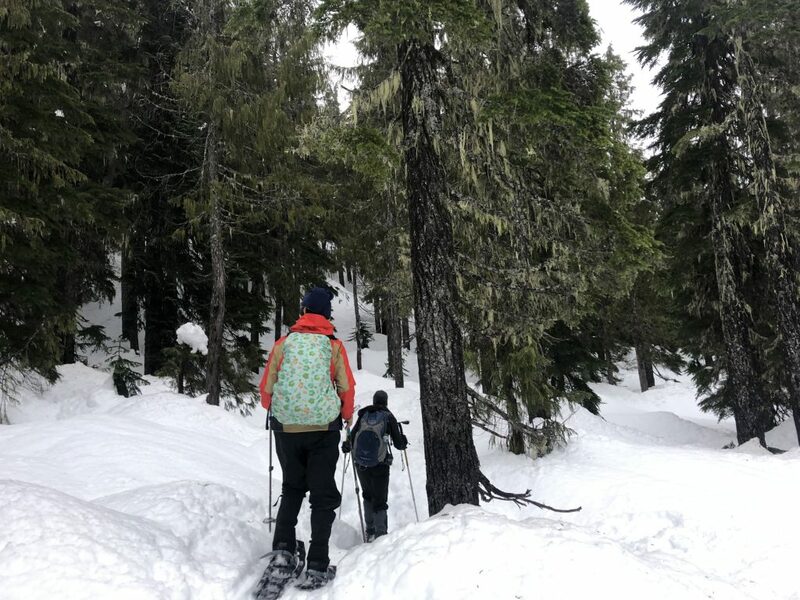 We stopped for a snack under the trees at the base of Elma, realizing that the wind, rain and wet snow were making it an uncomfortable trek as the water permeated the boots of one of our hikers. We decided to turn around to ensure our hike would end well with the recognition we had approximately 2 hours remaining to hike to return to the dryness of our vehicle. The return proceeded quickly, we crossed the creek without incident, and arrived at the road to remove our snowshoes and have a short walk back to the car. Despite the weather, we had a wonderful hike, shared stories and even one involving a proposal on Elma! You were such a cheerful and lovely leader!